Pink Peony Leaf Petals! Available in a handy 16oz. (by volume) jar sealed with a plastic cap which provides two options for either spooning the leaves or shaking. Approximately 2 cups of leaves. Pink Peony ECO-Paks! If your tired of all the plastic jars and are "ECO-FRIENDLY", our NEW 24oz. (by volume) bag of SuperLEAFS are the ticket! Approximately 3 cups of leaves. Thats 8oz. MORE for the same price! Pink Peony Leaf Petals 1-Gallon SuperPak! For those layouts in need of lots of premier leafy trees - available in 1-gallon super-size bag! Pink Petunia Leaf Petals! Available in a handy 16oz. (by volume) jar sealed with a plastic cap which provides two options for either spooning the leaves or shaking. Approximately 2 cups of leaves. Pink Petunia SuperLEAF ECO-Pak! If your tired of all the plastic jars and are "ECO-FRIENDLY", our NEW 24oz. (by volume) bag of SuperLEAFS are the ticket! Approximately 3 cups of leaves. Thats 8oz. MORE for the same price! Pink Petunia Leaf Petals 1-Gallon SuperPak! For those layouts in need of lots of premier leafy trees - available in 1-gallon super-size bag! Japanese Cherry Leaf Petals 1-Gallon SuperPak! For those layouts in need of lots of premier leafy trees - available in 1-gallon super-size bag! Lavender Leaf Petals! Available in a handy 16oz. (by volume) jar sealed with a plastic cap which provides two options for either spooning the leaves or shaking. Approximately 2 cups of leaves. Lavender Leaf Petals ECO-Pak! If your tired of all the plastic jars and are "ECO-FRIENDLY", our NEW 24oz. (by volume) bag of SuperLEAFS are the ticket! Approximately 3 cups of leaves. Thats 8oz. MORE for the same price! Lavender Leaf Petals 1-Gallon SuperPak! For those layouts in need of lots of premier leaf - available in 1-gallon super-size bag! LEAF LITTER SUPERLEAF 16 OZ. LEAF LITTER SuperLEAF! Available in a handly 16oz. (by volume) jar sealed with a plastic cap which provides two options for either spooning the leaves or shaking. Approximately 2 cups of leaves. LEAF LITTER SuperLEAF ECO-Pak! Ideal Leaf-Litter!! A multi-dimensional light brown leaf blend which provides highlights to shadows, tree branches, shrubbery, vines and leaves. 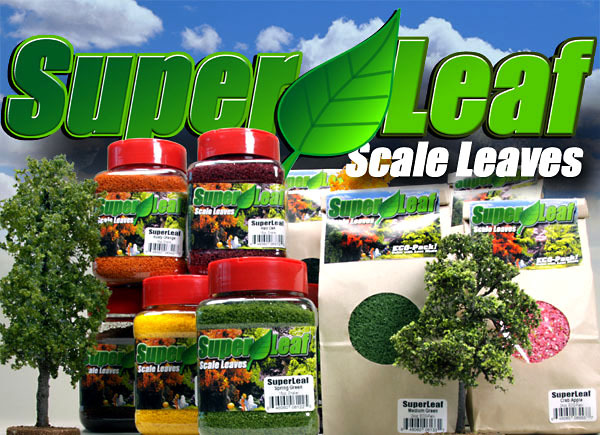 LEAF LITTER SuperLEAF 1-Gallon SuperPak! For those layouts in need of lots of premier leafy trees - available in 1-gallon super-size bag!